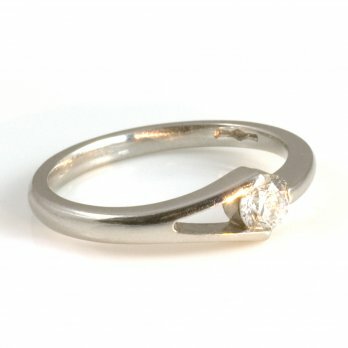 A single stone round brilliant cut diamond is set by 3 claws in a platinum setting. The setting is unusual and has 2 claws creating an open split on one side and a single claw opposite. A daring yet subtle design for a modern woman with a sophisticated air.